Cause: 1) high mechanical pulp ratio, less chemical pulp, low strength wet paper. 2) Feeding pulp beating degree is too high, dehydration speed is slow, the water line is lengthened, the paper is easy to break in the couch roller. 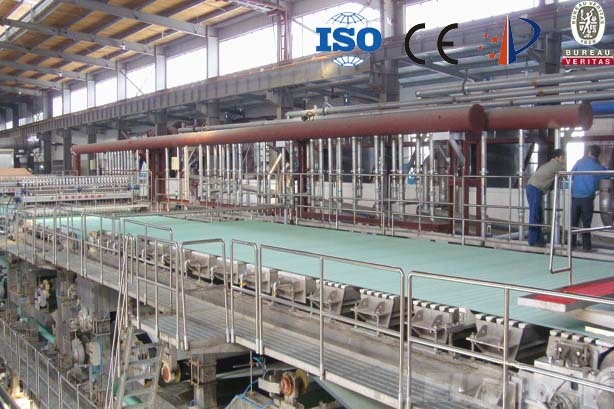 3) The low degree of vacuum roller, dehydration is not good; sometimes a high degree of vacuum, but the number of holes blocked more, when out of the roller the water is still large. 4) Pulp speed is too much below the speed of the wire, so that there is a disconnect fiberglass, resulting in paper broke. Solution: 1) The amount of chemical pulp should be increased to improve the paper wet strength. 2) Appropriate to reduce mechanical pulp and chemical pulp beating degree, improve drainage performance. 3) Check the volt seal system and vacuum system for leaks. 4) The discharge valve to open large and improve the speed of the motor speed of the sizing pump to ensure that the head of the headbox to improve the pulp speed to prevent dislocation of fibrous tissue.